Avengers: Endgame, surely the most anticipated film of 2019, is nearly upon us. In a matter of weeks, we’ll actually be able to see what’s happened in the time since the end of Avengers: Infinity War, when Thanos completed his gauntlet and wiped out half of the universe with a snap of his fingers. Both Ant-Man and the Wasp and Captain Marvel took place before the decimation, so Endgame will be the first film actually set in a post-snap world. 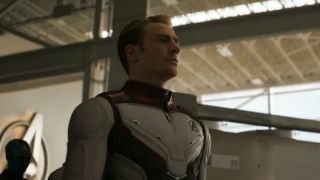 And Endgame isn’t just a sequel to Infinity War: it also serves as a culmination to the Marvel Cinematic Universe’s Phase 3, and the entire ‘Infinity Saga’ to date. So it’s fair to say there’s a lot resting on this film. The plot has been shrouded in the kind of secrecy that goes beyond what you’d expect even from a Star Wars Episode. Very little is known about the actual plot, but it was revealed that the run time was clocking in at around three-hour mark, making it far and away the longest MCU movie to date. Avengers: Endgame opens in the UK on April 25, 2019, and in the US on April 26, and you can read all about it in the new issue of Total Film magazine, which hits shelves this Friday, April 5. For much more from the Russo brothers and Markus and McFeely, as well as loads of additional MCU goodness, check it out! If you’re a fan of Total Film, why not subscribe so that you never miss an issue, and you’ll also get exclusive subscriber-only covers like the one below, delivered directly to your doormat before it hits shelves? What are you waiting for? We’re currently running a subscription offer where you can subscribe from as little as £12.25 to get an Alien Funko Pop! And 50 Greatest Sci-Fi Movies book, worth £20! Or you can upgrade your package to get Alien: Isolation on Xbox or PS4 too. Head to My Favourite Magazines now to take advantage of the offer. (Ts and Cs apply).